The counties will lock horns in Ennis on Thursday evening. 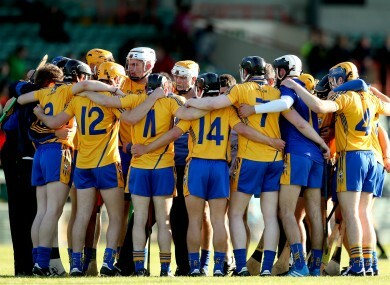 The Clare team huddle before last year's Bord Gáis Energy Munster U21 hurling quarter-final against Limerick. CLARE BOSS DONAL Moloney has named an unchanged team for tomorrow evening’s Bord Gáis Energy Munster U21 hurling final, as the Banner County aim for a fourth successive provincial crown. The same starting 15 that accounted for a fancied Waterford outfit at the semi-final stage has been selected. Conor Cleary will captain the team from centre back with 2013 All-Ireland senior final replay hero Shane O’Donnell spearheading the attack. Bobby Duggan and Ian Galvin ran riot against the Déise last time out and are named in the wing-forward positions. There’s one change from the Limerick team that beat Tipperary as Kevin O’Brien misses out through injury. He’s replaced in the full-forward line by Pallasgreen’s Colin Ryan. Throw-in at Cusack Park in Ennis is at 7pm and the game is live on TG4. Email “Clare and Limerick unveil team selections for Munster U21 hurling final”. Feedback on “Clare and Limerick unveil team selections for Munster U21 hurling final”.